In August of 1963, Martin Luther King, Jr., the iconic civil rights activist, spoke these immortal words: “I have a dream that one day this nation will rise up and live out the true meaning of the creed: ‘We hold these truths to be self-evident; that all men are created equal.’’ Under recent academic meddling, however, this dream has little likelihood of coming true. Not because we didn’t have Brown v. Board of Education (1954-school integration) or Loving v. Virginia (1967-interracial marriage), but because there still exits a stream of thought which judges people not by “the content of their character,” but “by the color of their skin.” Bent upon regressing towards a separated, stratified society, this group continues to fan the flames of suspicion and division across racial lines, all under the guise of “sensitivity,” “openness” and “diversity.” Calling themselves “Progressives,” in actuality, they progress towards nothing, but only regress backwards to a racist, suspicious and violent time in our nation’s history. Using the terms “cultural appropriation” and “unity among the African Diaspora,” the Regressives seek to separate our nation into piles, as with dirty laundry. For in doing so, they break the collective power of the people to bind together and to positively effect change. They have found a way to disenfranchise the citizen’s voice in order to grant themselves the awe-inspiring task of ideological control. Experts define cultural appropriation as adopting parts of a culture or ethnic group without the permission of the originating culture thereby “violating” their collective intellectual property rights. It has now become a popular way for a person to claim “rights” to fashion, customs, food and culture. Yet, claiming “rights” to customs, transforms us into tribalistic groups which refuse to acknowledge the reality of our blended world: that for all time, we have shared and “borrowed” ideas, thoughts and traditions to which no one owns the patent or trademark. Recently, Kooks Burritos, a Mexican food truck in Portland Oregon was forced to close because opponents claimed that the two white woman owners “appropriated” the recipes from Puerto Nuevo, Mexico. The two women traveled to Mexico on vacation, asking the cooks how they made their burritos and watched them through the windows. They used these recipes to make their burritos for their food truck. However, under the pressure of the community, they stopped their business. In the case of Kooks Burritos, the cultural appropriation police did not clearly define their terms. Would this have been different if the owners were Mexican or Mexican heritage? What if they had received the recipes from their friend’s grandmother? Perhaps in order to sell ethnic food, you need to be of that ethnicity. By this standard, Julia Child, the American chef whose monumental work, Mastering the Art of French Cooking, which brought hidden French recipes to the American market, would be counted among the worst cultural appropriators in modern times. Her autobiography, My Life in France, tells of how she made friends with French people, went to their cooking school and learned their methods. Only to turn around and (gasp!) write a cookbook and start a cooking show. Yet, everyone applauds Julia Child’s cookbook not as cultural “stealing” but rather cultural sharing which benefits everyone. Another recent example took place at Pitzer College in Claremont California. In March of this year, the wall of free speech, where students can write whatever they want, read “White girl, take off your hoops!! !” This statement referenced hoop earrings, which, according to the artist of the statement, belonged exclusively to non-white people. She stated in an email thread sent to the entire student body that “white people have exploited the culture and made it fashion.” She fails, however to note that hoop earrings have historically been worn by Roman women in the first century, as well as Russian and Swiss women in the 18th century. In addition to the emphasis on cultural appropriation, the Regressives have revived segregation (yes, really). Recently, the New York chapter of Black Lives Matter hosted a “black only” Memorial Day party. Harvard hosted a black graduate school graduation initiated by black members of the class of 2017, to celebrate the achievements of black students and those from the “African Diaspora.” Several universities across the country including California State University, Los Angeles, University of Connecticut, University of California, Davis, University of California, Berkeley and University of Colorado, Boulder now offer segregated black dorms as “safe” and “protected” spaces. The Regressives do not have to separate people based on race, but rather have cleverly convinced people to separate themselves. In that separation and isolation, there exists no unity on basis of family, faith or values but rather a unity in the hatred of those who disagree…unified in the hatred of dissidents, all in a disingenuous effort to be “sensitive.” In reality, we are now seeing the true colors of the diversity movement which assumes that ethnicity determines ideology while denying people the freedom to think on their own, to unite with others and to be citizens for a positive future. Roman: In 1760, archeologists uncovered the fresco, “Woman with Wax Tablets and Stylus” also known as “Sappho” among the ruins of Pompeii, the city destroyed by the Mount Vesuvius volcano in 79 A.D. The piece is dated 55-79 A.D. and depicts a wealthy girl with tablets, stylus and adorned in fine clothing and jewelry. Note her earrings are hoop earrings. French painter, Elisabeth Louise Vigée-Lebrun (1755-1842) did a series of sketches of the women and children of the Russian court. This sketch depicts Princess Catherine Chikovskoy. The Princess wears hoop earrings. Elisabeth Louise Vigée-Lebrun (1755-1842). 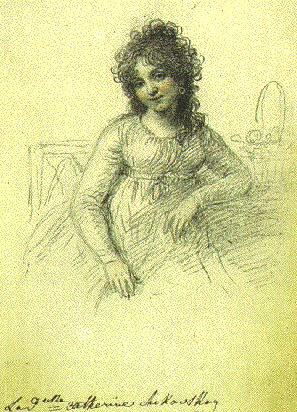 Princess Catherine Chikovskoy from Sketchbook Comprising Thrity-Eight Portrait Drawings of Women and Children of the Russian Court, c. 1801. Graphite and chalk on paper, 7 x 4 3/8 in. (17.8 x 11.1 cm). Swiss artist: Angelica Kauffman (1740-1807.) A Bust of Girl with an Earring, 1770. Etching on paper, 5 x 4.75 in. (12.7 x 12.1 cm). Scroll down to “Artwork” section of the webpage. The young girl wears hoop earrings. For more information on Vigée-Lebrun (p. 52) and Angelica Kauffman (p. 61) see the book, by Susan Fisher Sterling. Woman Artists: National Museum of Women in the Arts. Second Edition. New York: Abbeville Press Publishers, 2010.